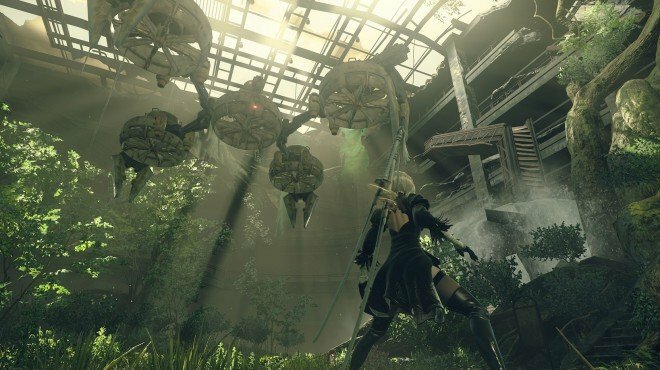 Retrieve the Confidential Intel is a Side Quest in NieR: Automata. "Help the Resistance member in the city ruins retrieve the plug-in chips with classified data. Secure the following items from the machine lifeforms." "After handing over the plug-in chips, the Resistance member seems happy, saying he'll introduce his family the next time you meet." "It turns out the Resistance member was repairing broken YoRHa models and turning them into his new family." "However, they were attacked and killed by machines..."
Deliver the plug-in chips to the Resistance member. Meet the Resistance Member at Desert Housing. You pick up this quest by speaking with a Resistance Member in the City Ruins near the factory access point after completing the Assault main quest. The location of the plug-in chips will be added to your map and you will need to obtain all three of them. At each location, a group of Enhanced Machines awaits. Defeating all of them including the largest one will add the necessary plug-in chip to your inventory. At the second site, your Pod will comment that the chip you obtained is a YoRHa unit chip, and that there's no reason for other units to possess it. After you obtain the last chip, a message from Command will inform you that a missing YoRHa unit with classified information must be found as soon as possible. Go back to the Resistance Member to decide what to do. Once there, you have the option to give him the chips, or refuse. If you refuse twice, 2B will ask him if he knows anything about a missing YoRHa unit. The android denies knowledge. The only way to proceed with this quest is to give him the chips. If you give him the chips, rewards are received but the quest stays open on your log. Go to Desert Housing and find the quest marker. Here the Resistance Member will introduce you to YorHa S-Type, a refurbished model he fixed with the chips you gave him. After this, when you go back to the Resistance Camp, an Inbox message from the Commander ends the quest. La música que ponen, después de hablar con èl en el desierto, es muy parecida a las que pusieron en resident evil 4, muy tenebrosa.\The music they play, after talking to him in the desert, is very similar to the ones they put in Resident Evil 4, very dark. This was one of the most disturbing quests in the game. Particularly the altered music and corrupted dialogue from his new &apos;family&apos;. I wouldn&apos;t be surprised if the badly-repaired scanner unit killed him and then itself in order to escape its forced and damaged existence. And what was he _doing_ with it, anyway? I came to Desert Housing but there is no Resistance Member at the marker! Then quest fails when i came to Flooded City by main quest. Spoiler(?) question: is it implied that YoRHa command ordered their assasination at the end? I bet Yorha was the one that killed his family. So you can&apos;t progress the quest until you hand the chips over? As of 1.03, DO NOT SKIP THE DIALOGUE FOR THIS QUEST. As in pressing start and skipping. You will cause the NPC to glitch and can&apos;t complete the quest.